A close neighbour to Una (One Truth); in Spenser’s poem Duessa (Double Truth) is the daughter of Falsehood and Shame, who disguises herself to beguile the Red Cross Knight (St George) who has been sent by Gloriana to slay the dragon. Christopher Route Gain a good leading spur from the junction of the West and East Christopher. From the shelf above the cirque wall of Una's Glacier Gully routes. 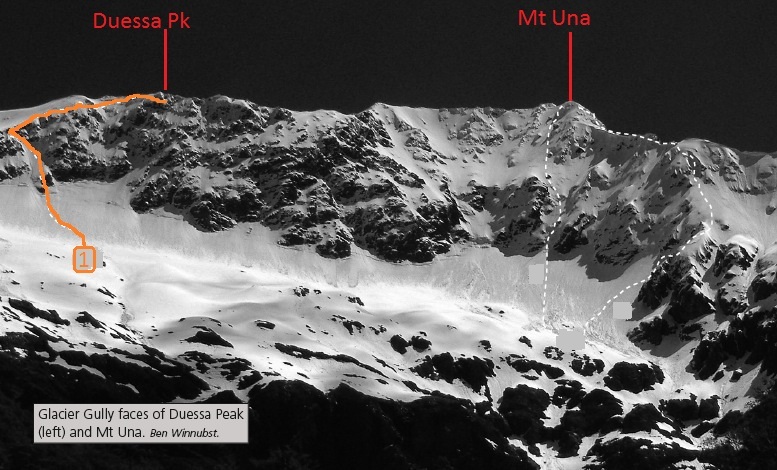 Climb a couloir (visible from Maling Pass) onto the ridge south-east of the peak.